The discussions will continue long and loud in barrooms and front rooms. Did Gareth Anscombe get enough downward pressure on the ball? Was Eddie Jones out of order in his pre-match psyche-out of Rhys Patchell? Are England going forward, backwards or stuck in neutral as they attempt to land a third Six Nations title and peak for next year's World Cup? That is all from us though. Catch you tomorrow for a bit of Scotland v France. "As much as Eddie Jones got a lot of stick this week for questioning Rhys Patchell, it had an effect on him today without a shadow of a doubt. "He was trying too hard. He was in great positions but he was stepping when he should have been clearing it, he was slicing it and taking a lot of contact which as a 10 which you don't want. He was on the deck a lot today. "He didn't have his best game and he wasn't lighting it up like last week. It says to me that it probably was niggling away in his head." Shall we have a look at that disallowed try one more time? BBC app users need to click the link. Greg Roe: Much better by Wales! Match officials today were appalling! Some horrendous decisions throughout! England have got away with one there! But its done now! Good luck England for the rest of the tournament! Colin Lawton: What I've seen of the Six Nations, it's Ireland's to lose. Mandy M: Wow I'm in bits. An amazing game of rugby! England great in attack and defence - Wales dug deep with into resilience and tenacity! Wow wow wow! Criv: Bitter Welsh fans as per. IMO the try should’ve been given but would’ve been different game. It’s NOT the reason you didn’t win. England by far superior team. Welsh defence offside a lot but no complaint from England. You win some and lose some get over it ! Graeme Hobbs: Wales mourning their try wasn’t given forgetting that Evans’ try last week involved a forward pass...swings and roundabouts and all that. Dave in Uxbridge Great game!! 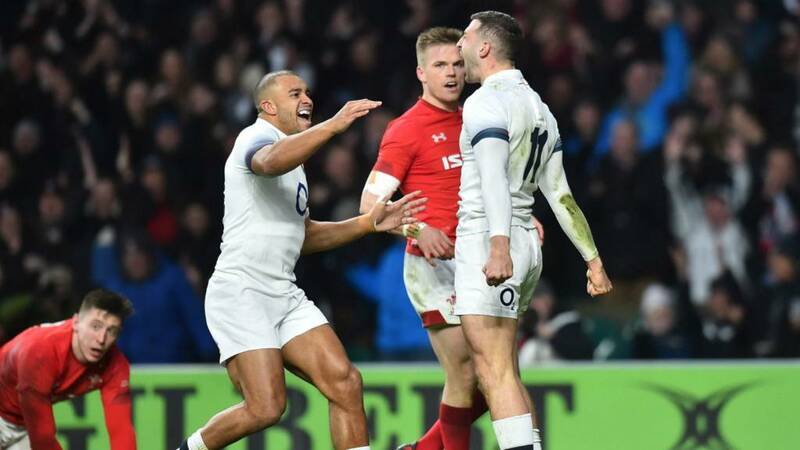 Don't know what the referee was doing - Wales had their hands all over the ball at every breakdown and twice forgot he'd given England advantage after a knock on, then allowed the Welsh to affect a turnover after England lost 10 metres. Still, he helped keep it tight, and the TMO decision (poor) balanced it up! Ian Herbert: Lucky or not,England won and that's all that matters. Ireland won't be worried!! ?That same Irish team that scraped past France? James in London: Very good win by England. Moments of class from Farrell and Launchbury in attack and Underhill in defence decided it. Good enough to build a Grand Slam from? Definitely. It's a win, same as Ireland last week and it was hard-earned! "It was a good old-fashioned arm wrestle today but we're getting good at winning those arm wrestles. It's great to see that when we're not quite at our best we are getting the results. I never thought it would be a routine win. Wales are tough, well-coached and a good side. "It would have been nice to score more points today but you have to give full credit to their defence. We got inside their 22 a number of times but couldn't unlock them. "We played better rugby during the game and took our opportunities. "I don't know why people say we're lucky with the refereeing decision. The TMO has all the time in the world to make his decision and I never get involved in what is decided." "We were slow out the blocks, after that first 20 minutes we got a foothold in the game. "We felt we should have got more out of the opportunities we had in the second half and we didn't have the accuracy we had last week. It was a patchy performance. We've got a two week break now so we've got to build on that." "We don't know. Hindsight never won or lost a game so we can't dwell on it." Here are your full-time stats. England full-back Mike Brown had a game to be proud of. 116 metres, 16 carries and three defenders beaten. England full-back Mike Brown talking to ITV Sport: "The effort to a man was unbelievable - Sam Underhill in the corner saving us, Maro Itoje hitting people around the corner - it was special, particularly from the forwards. "We always want to hit teams first and take the momentum away from them. We maybe knocked off a bit in the middle but we will look at that again. Asked about Gareth Anscombe's disallowed score: "You work hard and you get your luck. The TMO is there to make those calls." Llwchwrjack: England had a lot of ball but the fact remains if Anscombes try was given, which it should have been, we might have won. Matthew Thorne: What. A. Game. That was test match rugby at its finest. Nothing but 100% intensity for the whole match. This is why the six nations is the greatest sporting event in the world! A gutsy England win. Chrissymitch: England very lucky to won there, TMO cost Wales a perfect try that would of been it. Plus Wales left 2 or 3 tries out there. Hang your head in shame TMO. It’s been a cracking game today. A really good England-Wales Test match. The difference between the sides was that England didn’t make mistakes and were very disciplined. Is that a good enough performance to build on to go towards a Grand Slam though? I'm not sure. England were sweating it in the end, but Wales' rally came too little too late. Jonny May's double-whammy of first-half tries left them with too much ground to make up ultimately. Ben Te'o's high tackle on Josh Navidi gives Wales a penalty advantage that they cash in before the clock turns red. Anscombe boots for touch and up to halfway. We are up to phase 16 off that England kick-off. Wales running the ball side to side, but not making much of an inroad. They are just outside their own 22m. Lungs must be burning though. Defensive holes are the next thing to appear. Wales spread the ball. Steff Evans makes a half-break. Back across to the right wing. Nothing to be gained down that cul-de-sac. So Hadleigh Parkes flings the big mis-pass back against the grain. Wales are not going to die wondering in this one.